NetherRealm Studios has announced the second downloadable character pack for their DC Universe fighting game, Injustice 2. The DLC includes Aquaman villain Black Manta—and two unexpected additions. From the studio’s own Mortal Kombat franchise is the God of Thunder, Raiden. Finally, the addition of Mike Mignola’s Hellboy rounds out the trio of new fighters. Hellboy, made famous by the Guillermo del Toro/Ron Perlman films, is a curious inclusion. Neither a DC Comics nor a Warner Bros. property, Hellboy actually comes from Dark Horse Comics. 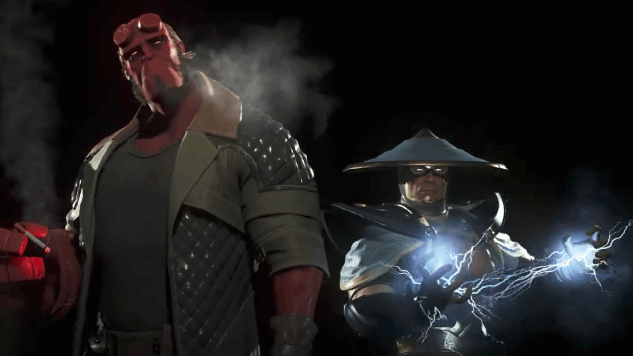 Nevertheless, Hellboy’s badassery is always welcome in NetherRealm’s crazy world. In the trailer below, Hellboy catches a missile shot by Black Manta and lights a cigar with it. “Thanks for the light, pal,” he wryly says. With a new R-rated reboot also on the way, we’ll be seeing a lot more of Hellboy in the near future. Fighter Pack 1 for Injustice 2 included Starfire, Red Hood and Mortal Kombat combatant (kombatant?) Sub-Zero, and came out on June 13 for $20. The trailer for Fighter Pack 2 does not reveal a release date, but mentions that gameplay for Black Manta will debut on Aug. 27 via NetherRealm’s Twitch channel. See for yourself below.